If you love striking and vibrant color then the Red Maple Tree could be a serious candidate for your garden. It is hardy and fast growing with lasting Fall Color. The Autumn Blaze (Acer fremanii) is cherished as the fastest growing Maple tree, having a hardy nature and superb color. This wonderful tree would be at home almost anywhere, beside your home or along a sidewalk. The blaze of color helps to soften the hot summer sun, and works well when in a group with other trees or on it's own. The Autumn Blaze Maple tree was introduced in the early 80's as a cross between the red and silver Maple, to provide a more robust and color consistent Maple for your home. 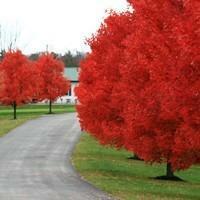 Due to it's popularity it has rapidly become one of the the most desirable Maple trees in the United States. Just imagine for a moment the outstanding beauty of the Autumn Blaze in your garden during the springtime, with it's sixty feet of reaching branches and forty foot wide oval canopy that create an image of symmetry throughout the year. The leaves of this tree emerge as green with a slight reddish tint, and all through the summer months you can practically watch it grow, up to three or more feet annually. During the fall the five inch orange-red leaves will provide a dazzling site when many other trees have long since faded. Probably one of the most beneficial reasons for having the Red Maple Autumn Blaze, apart from it's color is that it is carefree. You’ll never have to worry again about raking up those messy seedlings or twigs, and as it’s disease and pest resistant there are no sprays or treatments required. Furthermore, during drought conditions this Maple is strong enough to get by on its own, and when heavy snows are damaging other trees, your Autumn Blaze will stand firm. The Autumn Blaze Maple is an outstanding tree that has won several “tree of the year” awards for its remarkable qualities, and will certainly prove to be a invaluable addition to your home.